Bilikiki Sliders opened the competition with a nail-biter against Sokamora which they won marginally at 6 goals to 5. In their second match of the competition they displayed more confidence and eased past KOSSA 5 – 1 to tally 6 points in Group A. KOSSA sit on second in the table with 3 points from 2 matches while Sokamora and Northern United, who are yet to register any points, sit third and fourth respectively. Both Bilikiki Sliders and KOSSA have only 1 match left to be played in the group stage. Northern United and Sokamora, on the other hand, still have 2 group matches in hand. Honiara West were the dominant side in Group B today and are by far the best performing side in the competition statistically. Their first win saw them score 5 goals to 2 against Manihots and they repeated their solid performance against Bilikiki Fliers defeating the second national team training squad in the competition by 5 – 3. Honiara West now has 6 points in the books and their closest rival, Bilikiki Fliers, have only 2 points from 2 matches today. The other 2 teams in the group, MOI Popi and Manihots still have 2 matches left in the group stage compared to 1 each for Honiara West and Bilikiki Fliers. KOSSA registered the biggest win in the first day of the competition after they defeated Northern United 6 – 1. Obed Ofea top performed for KOSSA with 3 goals to his name while Charlie Otainao and Johnson Wanefai also got in the act with their contributions. However, KOSSA were not able to repeat their winning performance in their second which was against Bilikiki Sliders. 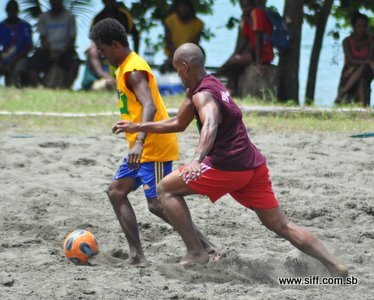 Bilikiki Challenges matches will continue tomorrow at DC Park. Northern United and Sokamora are set to open day 2 of the tournament at 10:00am. The finals of the tournament will take place on Sunday. Entrance to DC Park for the Bilikiki Challenge is free. Members of the public are encouraged to turn out and support the teams.